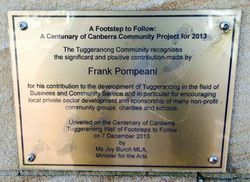 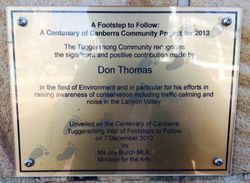 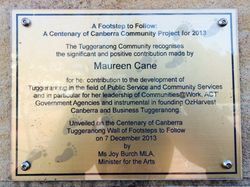 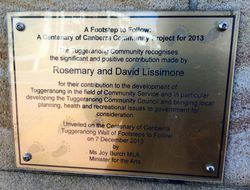 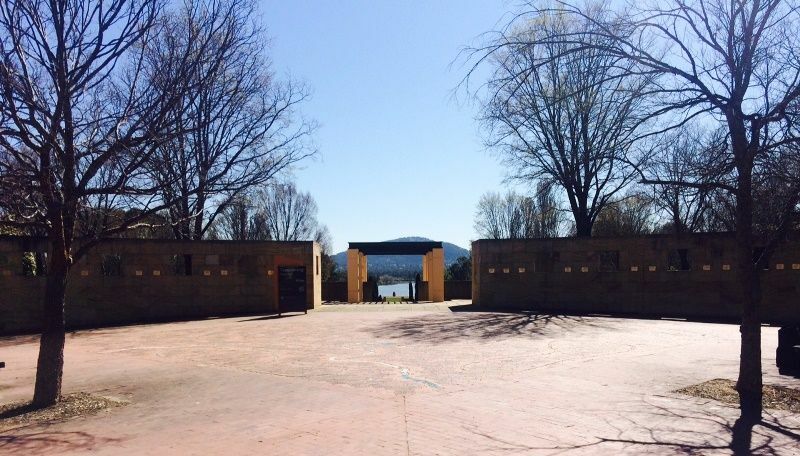 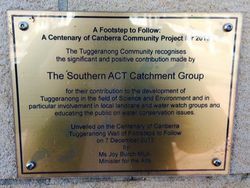 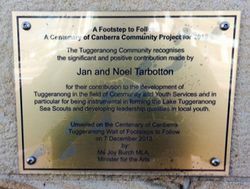 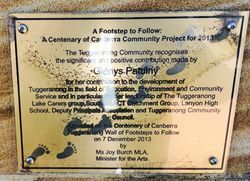 "Footsteps to Follow" is a monument which contains a number of plaques which commemorate individuals and groups who have made a significant and positive contribution to the development of Tuggeranong since 1974. 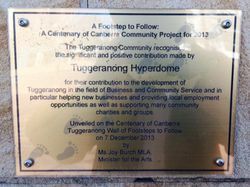 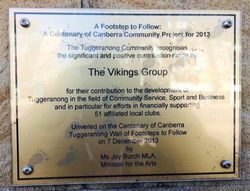 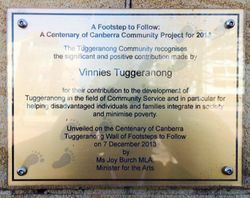 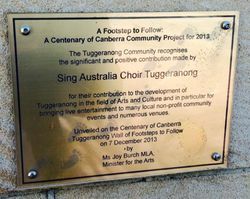 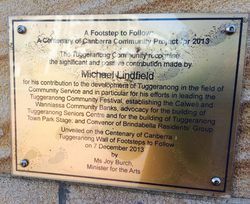 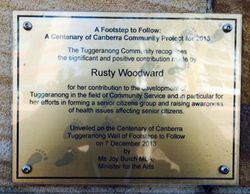 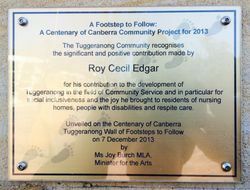 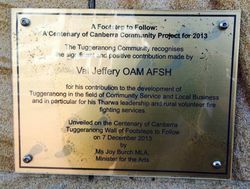 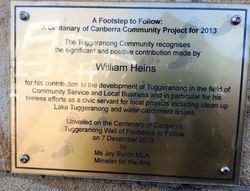 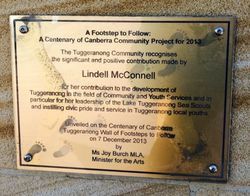 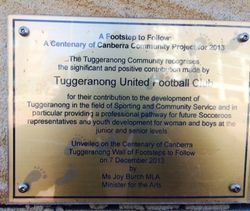 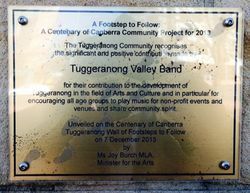 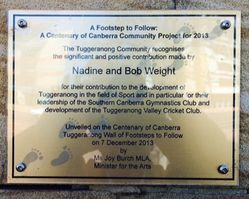 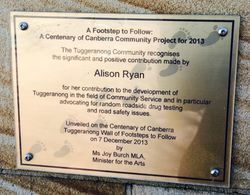 Individual plaques of the 25 Foundation Members were unveiled on 7 December 2013 by Mick Gentleman MLA who was representing Joy Burch MLA, Minister for the Arts. 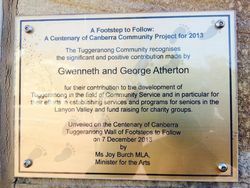 Gwenneth and George Atherton, Maureen Cane, Roy Cecil Edgar, Susan Foley, Jill Faulkner, William Heins, Val Jeffery OAM AFSH, Michael Lindfield, Rosemary and David Lissimore, Lindell McConnell, Messengers Program, Glenys Patulny, Frank Pompeani, Alison Ryan, Sing Australia Choir Tuggeranong, Jan and Noel Tarbotton, The Southern ACT Catchment Group, Don Thomas, The Vikings Group, Tuggeranong Hyperdome, Tuggeranong United Football Club, Tuggeranong Valley Band, Vinnies Tuggeranong, Nadine and Bob Weight, and Rusty Woodward.